Between galavanting around the beautiful Disney ships...and eating, and eating...it can be surprisingly hard to find time to relax. 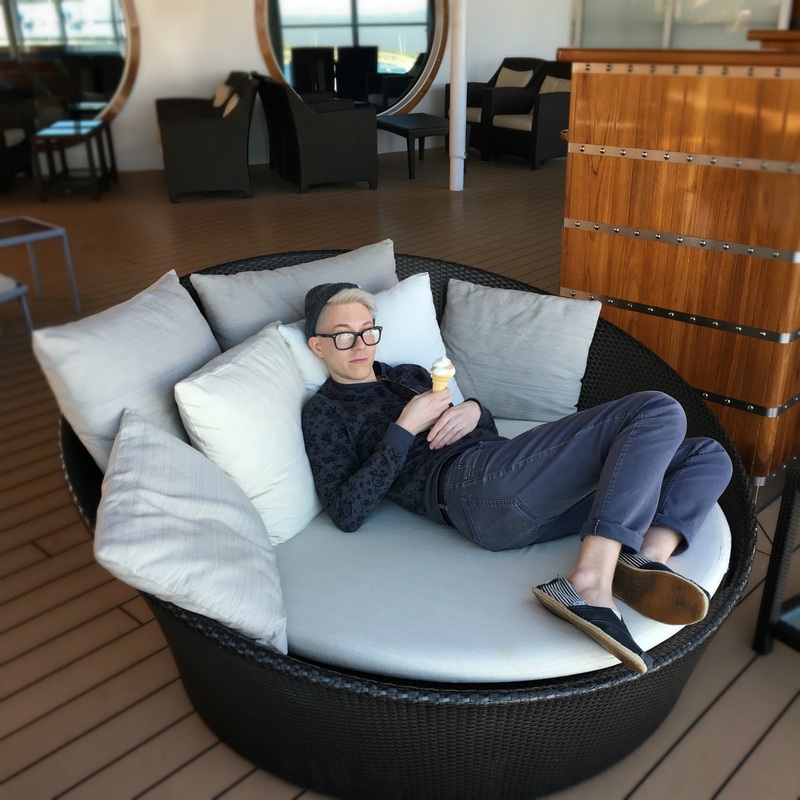 In an effort to ease your Disney Cruise planning we did all the hard stuff for you, and "researched" where the best places are to just sit and relax. Depending on what style cabin you have, the giant in room porthole with bench might not be an option for you. In fact, a very limited number of cabins has this feature. BUT WE LOVE IT. The window seat is just big enough to curl up on and watch the ocean go by. This is especially nice with room service breakfast. In the atrium of both the Disney Fantasy and Dream there are two cushy thrones. 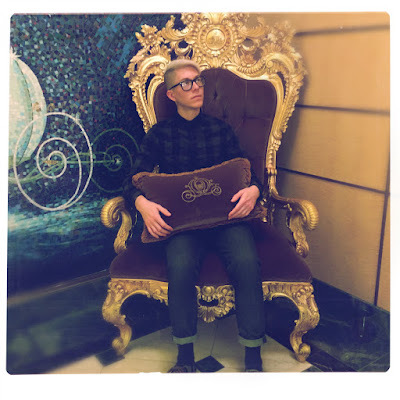 Yes, legit thrones. The back drop to these thrones are lovely Cinderella murals, but the real reason to sit here is the view. This location offers a prime viewing location for people watching inside the ship. Plus, you basically get to sit like royalty. Another feature found only on the Fantasy and Dream is what I refer to as the amazing cool mist bench from heaven. This spot is located in the middle of the adults only wading pool, adjacent to the pool bar. You dont even have to leave the water to get a drink, and the mist that emanates keeps you cool even on the hottest day. 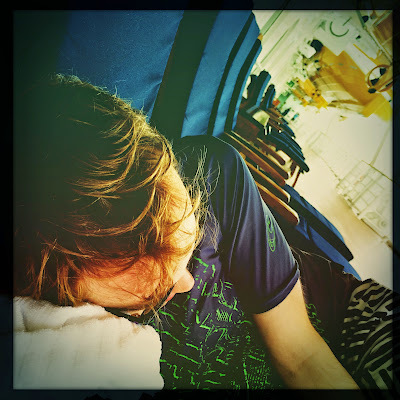 This picture features a soundly sleeping Adam, because it is his absolute favorite place in the world. Deck four is home of the lifeboats, shuffle board, walking course, and the MOST COMFORTABLE LOUNGE CHAIRS IN THE WORLD. This deck also happens to be significantly more peaceful than the upper decks, and there has never been a time when there weren't chairs available. Finally. The single most sought after place to sit on any Disney Cruise. The random round chair thing by Cove Cafe. Something about this magical chair will lull you into a peaceful slumber (or a sugar induced coma...) and the fact that its big enough for two is even better. The only problem is that EVERYONE ON THE CRUISE knows about this chair, and getting access to it involves staking it out at 5:00 AM. But hey, totally worth it. Hope you enjoyed our little tour of favorite places to sit on the Disney Cruise Line. With not one but TWO cruises coming up in the next year, including our first time on the Disney Dream, I'm sure we will expand upon these places in the near future. Happy sailing! Follow Along! Instagram, Twitter, Facebook, Youtube.